Explanation: What happened to this ship? It was carried aground by a giant storm that struck the coast of Argentina in 2002. The pictured abandoned boat, dubbed Naufragio del Chubasco, wrecked near the nearly abandoned town of Cabo Raso (population: 1). 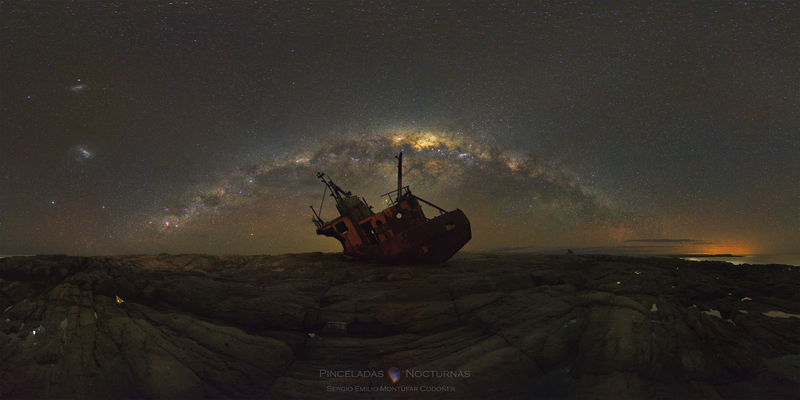 The rusting ship provides a picturesque but perhaps creepy foreground for the beautiful sky above. This sky is crowned by the grand arch of our Milky Way and features galaxies including the Large and Small Magellanic Clouds, stars including Canopus and Altair, planets including Mars and Neptune, and nebulas including the Lagoon, Carina, and the Coal Sack. The mosaic was composed from over 80 images taken in early September. A 360-degree interactive panoramic version of this image is also available. The adventurous astrophotographer reports that the creepiest part of taking this picture was not the abandoned ship, but the unusual prevalence of black and hairy caterpillars. Got a pic of one of the caterpillars, Sergio? The panorama is beautiful, but I wonder why the caterpillars bothered you. Note, in the large image, that the bar of the Large Magellanic Cloud is faintly yellowish. 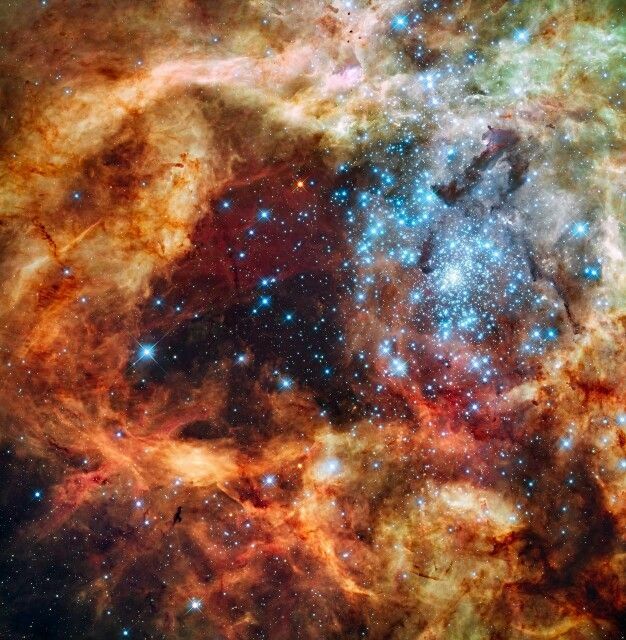 But below the bar is a blue-white "star", which must be R136a, the tremendously large and brilliant cluster. I wonder why the caterpillars bothered you. Annotated versions are seldom aesthetic. They're simply informational. That's why the main image is unannotated. He's probably referring to the hi-res click-thru image. You can see the unannotated image here. Ah. I didn't click through on this image. It's unusual for the click-thru to be the annotated version. Thanks for the great picture of skies we never see here in the north. Isn't September the start of the spring in Argentine? That could explain the ugly caterpillars on their way of becoming beautiful butterflies. Yikes! That's really nasty. Way worse than poison ivy! 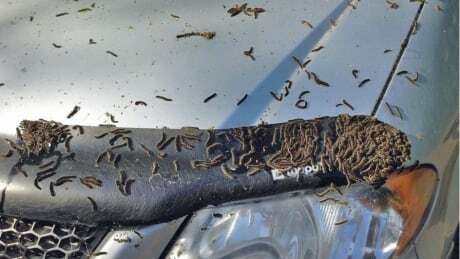 Martian Caterpillars got to be worse, right??? Well, here is to our intrepid photog, and an interesting image. Also a slightly illusory picture as the ship in the front is pointing left, toward the big ship on the sky: the constellation Argo Navis with Canopus. Nowadays you don't talk about Argo Navis as it is so big and one instead speak about the constellations Carina, Vela and Puppis. The new APOD has been up for probably at least twenty minutes, but no discussion page is linked to it. Instead, the Discuss link for APOD, December 1, takes us here. geckzilla wrote: Got a pic of one of the caterpillars, Sergio? The panorama is beautiful, but I wonder why the caterpillars bothered you. alcor wrote: A wonderful image. I wonder if my computer is missing some software as the item brought up through the link in the "A 360-degree interactive panoramic version of this image is also available" only brings up a video that seems to have no interactive feature. The video shows only the APOD image then at about 2 minutes 15 seconds the annotated version appears lasting to the end of the little over 4 minutes video (all through the video there is what sounds like waves crashing) . Is the video interactive for other users? DavidLeodis wrote: I wonder if my computer is missing some software as the item brought up through the link in the "A 360-degree interactive panoramic version of this image is also available" only brings up a video that seems to have no interactive feature. The video shows only the APOD image then at about 2 minutes 15 seconds the annotated version appears lasting to the end of the little over 4 minutes video (all through the video there is what sounds like waves crashing) . Is the video interactive for other users? It's just a video for me too. Thanks for responding Rob . DavidLeodis wrote: "A 360-degree interactive panoramic version of this image is also available" Is the video interactive for other users? For me, it works interactive with the Firefox webbrowser, obviously Google Chrome too, and the YouTube mobile app. The desktoptop version has a four arrow circular controller, keyboard (WASD) and mouse control (grab-and-drag); on mobile the view follows the spatial orientation of the device. Hi Case. Thanks for that . I routinely use Internet Explorer but I do have Firefox so I've just tried that and the interactive version works (it's not very exciting though ). I hope however that there is not going to be a trend to need specific browsers to fully use APOD or even access APOD. And in my case, I tested the APOD image in Firefox, Safari and Opera, each of them the latest version operating in the latest Mac OS on a recent model iMac. So whatever code the image is supposed to use for interactivity seems not to be browser specific, rather it may be OS specific -- which, if true, would be completely contrary to what the internet is about. rstevenson wrote: And in my case, I tested the APOD image in Firefox, Safari and Opera, each of them the latest version operating in the latest Mac OS on a recent model iMac. So whatever code the image is supposed to use for interactivity seems not to be browser specific, rather it may be OS specific -- which, if true, would be completely contrary to what the internet is about. It's just an IE thing. And it's not even a modern IE thing. If your browser is up to date, there is no problem. I just tested it with the latest IE that comes with Win10 automatically. No issues. Old IE used to have a TON of issues because they owned such a high percent of the user share that they tried to set their own standards instead of agreeing upon the set of standards everyone was supposed to use. Those days are done and gone though and the IE developers seem to be playing fairly now. I can run the interactive version just fine in both Firefox and Chrome on El Capitan. Safari comes up with the non-interactive version and a banner saying it doesn't support 360°video playback. YouTube documents the fact that Safari isn't supported (but Chrome, Firefox, IE, and Opera are). That's not surprising, because Safari is barely supported and is the least standards compliant browser out there.